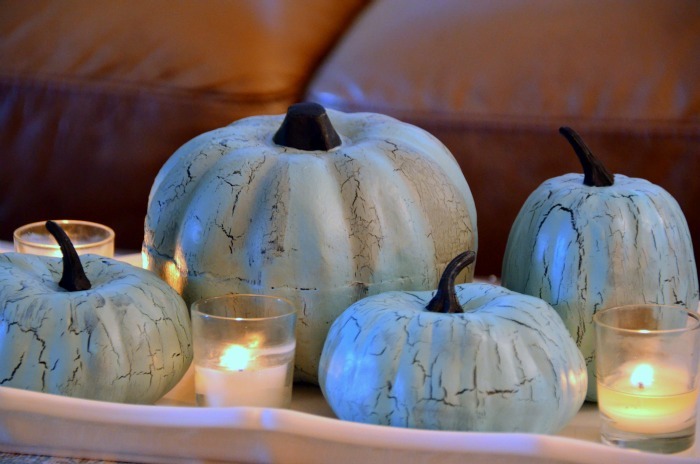 I was inspired by Jen’s gorgeous blue pumpkins that she created last fall and I just had to make my own! This craft is so easy and can be done in an evening. Jen has a fantastic tutorial for you as well, but I thought I’d show you how I did it. 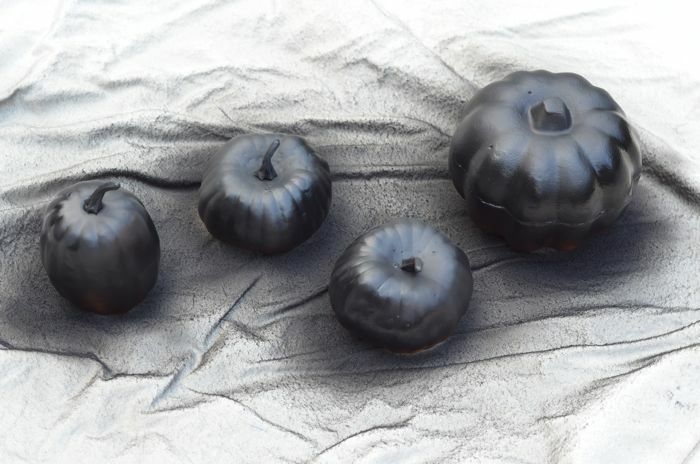 First, spray paint your pumpkins black. I did two light coats on each side. When you’re finished, they’ll look like this. Be sure to flip them over and spray the undersides. Sometimes I forget to do this. LOL! 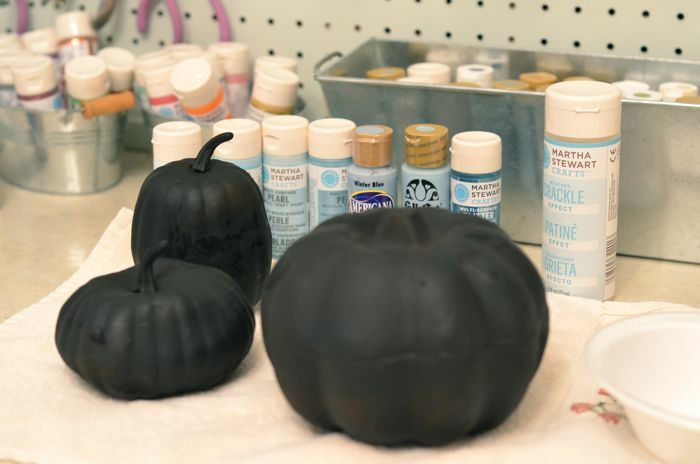 When fully dry, paint your crackle medium over your pumpkins (excluding the stems) and follow directions on bottle. I used Martha Stewart’s crackle medium which needed to fully dry before applying my paint. Once your medium dries, mix together your paint and brush on in even, long strokes. Crackle medium isn’t very forgiving so don’t paint with many strokes. Just work quickly and evenly. The paint will crackle as it dries. I used a hair dryer to speed the process along because I have the patience of a toddler :). 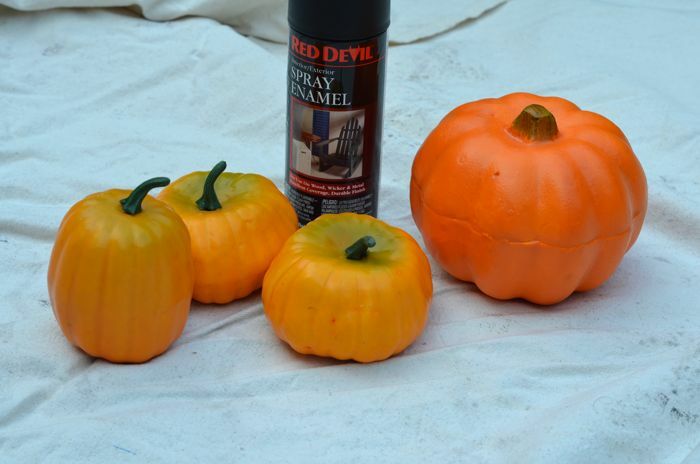 I also varied my paint colors for each pumpkin to add interest. On the large pumpkin, I painted some stripes of blue over the dried crackle just to set it apart a bit from the rest. And here they are looking all blue and crackly! Let’s pan out a bit so you can see my entire vignette. Side note…see those pillows? I actually sewed them! Yes, me…SEW! It felt weird to not use my glue gun or stitch witchery on fabric, but I learned that I can actually sew something when I feel like it. Just don’t look too closely at my seams. And one more gratuitous picture for you! And all of you safety conscious worry warts, no need to warn me, I promise not to light the candle inside the birdcage *wink*. So who says fall has to be orange, yellow, and red? I think it’s looking rather cute in blue! Thanks Jen for your inspiration girl! p.s. I’m over on Tip Junkie today for her Master Class Series. I’m sharing my thoughts and advice on blogging! Come say hi. I love the blue crackle! Very creative and edgy! I make have to give this a try! Great work! I featured you in a little weekend wrap up post today 🙂 Check it out! SO CUTE! your pumpkins looks so much better painted! I love that you got them at the dollar store. Thanks for sharing! GREAT idea – thank you! I confess I bought a peacock blue ceramic pumpkin at Hobby Lobby earlier this week for my dining room, which is rocking a combination of deep oranges and reds and peacock blue. I’ll definitely have to gather up some cheap little pumpkins and give this a try for our mantel and other areas that need a little somethin-somethin for fall! I love this, thanks for sharing – so glad I stopped by today. Hi Beth! I loved these pumpkins so much that I posted them over on my blog. I’m a new blogger (so not much of a following yet) but wanted to share your pumpkin makeover. Very inspiring. Thanks! I LOVE the runner on your coffee table! That is such a good idea especially if it has imperfections. Do you have a tutorial for it? What SMURFtanstic idea….lovin the blue hues! I have TONS of pumpkins….just need the other materials! Thanks for sharing! These are gorgeous! I’m gonna have to try this! I never thought I would love blue pumpkins! Love them! Love me some blue pumpkins. Great display girl! Ooohh, I love these! I’m going to make some too. Thank you for the how to! Have a great evening. Oooooo! They look fabulous!!! I’m so inspired now! That table runner is GORG!! O how pretty! I’m borrowing this idea for sure- thank you for sharing. I love this. 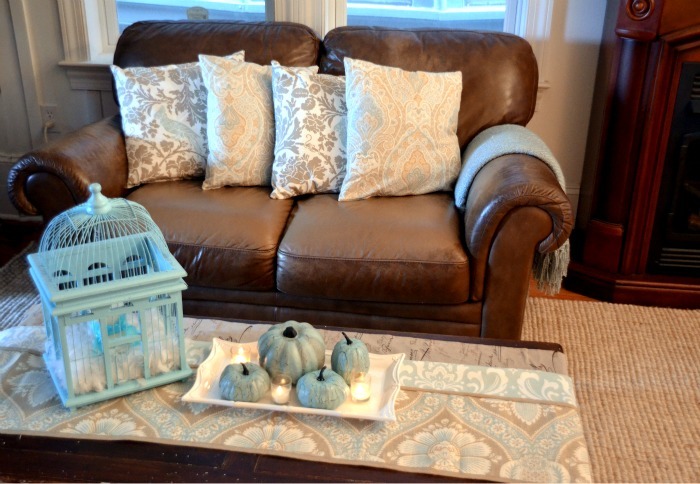 I was looking for ways to use blues and naturals for fall instead of the traditional oranges and reds. I must try this. Thanks for inspiring! these are gorgeous! can you share what color blue you used? 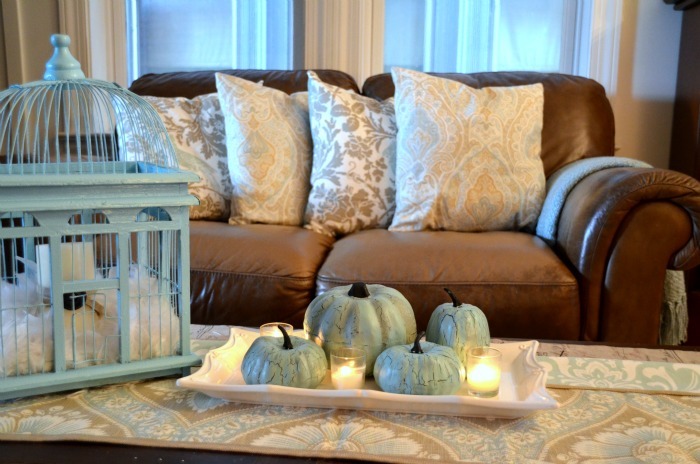 i’m so ready to decorate for fall!!! Too many to list! LOL! I just grabbed about five different shades of blue and a little brown and mixed until I liked the color. I varied it a bit for each pumpkin. The pumpkins are gorgeous!!! Love them! I am also loving your blue bird cage. I have one very similar and love that shade of blue! Could you share the color??? Hi Denise! Thank you! The birdcage was sprayed with Krylon’s Ocean Blue indoor/outdoor spray paint. Those are gorgeous! Great job! Wow, these look fab and I love the crackle effect! Cheers. I have never been a big fan of pumpkins. Must be the orange… But seeing those lovely white ones on Rhoda’s blog today and your gorgeous crackled ones, is making me change my heart. Maybe I’ll go hunting for some pumpkins of my own. I love what you did with them they look absolutely lovely. Love your pillows too, and hooray for you sewing them!! Wow! I’m really Loving those Blue pumpkins! Thanks for sharing! 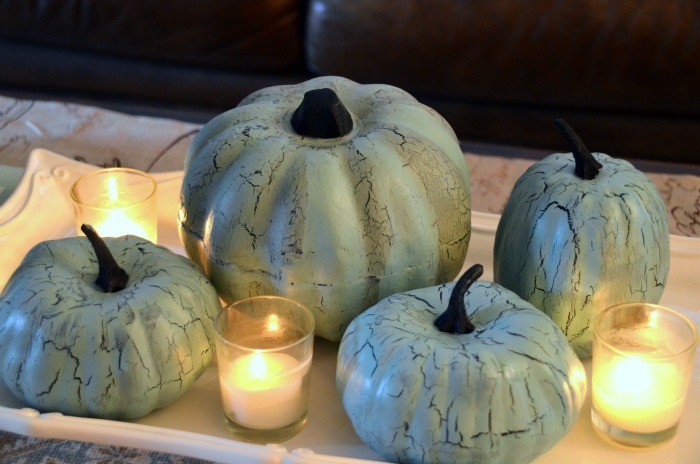 I’ve never seen blue pumpkins before – these look fantastic! I spray painted pumpkins last year (purple, black and silver), but the spray paint chipped off easily. What brand of spray paint do you use? These are perfect! I’m not a big fan of “traditional” Halloween/autumn decor because I don’t really like warm colors that much. Thank you for using a non-traditional color – it works so well! I’m off to think of my own ideas for unique fall decorating! Love em girl!!!! We should be sisters! Very cute! Never used the crackle stuff…looks pretty simple though. One more thing to add to my purchase list. Thanks for sharing! They are beautiful! And please NEVER ever come to my house and look at my seams. I still have to finish two pillows made from Pottery Barn napkins! I love it! I was thinking of painting some pumpkins white. I’m not a fan of all the typical “fall” colours for decorating my house. Do you think it would work to paint actual pumpkins? Yes I do! I think you’d need to be extra careful with your paint strokes over the crackle medium (if you go over it twice it “tears” the paint). But I’ve spray painted real pumpkins before with success. Thank you! Yeah….I’ve used the crackle medium before…it’s finicky stuff, but if done right…looks awesome! Thanks again! This appeals to me because I don’t care for orange.